Lisa Hammond is grinning from ear to ear these days. She’s crazy about animals and has landed the best job in town. But it’s one that she created herself with the help of the Community Business Development Centre (CBDC) in Shelburne. 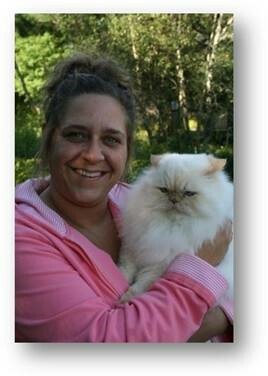 Hammond owns and operates Happy Hearts Pet Sitting. It’s a service that is gaining attention in Shelburne County. In a nutshell: if you go away, a pet sitter visits on a regular basis. This means that pets receive personalized attention and their routine is not interrupted. It also means that when you use a pet sitter instead of a kennel, that no excess vaccinations are needed. And there’s no chance of their coming home with fleas. But the best news is that a home can be occupied while the pet owner is away so that ensures the safety and well being not only of pets, but also of people’s homes and belongings. The pet-lover-turned entrepreneur first got the idea about seven years ago when she was working at the Beulah Burman Shelter. At that time, the shelter boarded family pets when their owners went away but Hammond saw how distressed the animals became when they were kennelled. “They never made the transition from the living room couch to being in a small cement cage. My own animals went through the same emotions and developed behaviour problems if I went away and put them in a kennel,” she says. Around this time Hammond heard about pet sitting services being offered in other areas. “The idea of starting my own business was exciting but scary so I held back a few years.” Then serendipity stepped in. She heard about the Self-Employment Benefits program offered by CBDC and applied. Now she’s up and running and it’s all systems go. “I take dogs for walks and swims. Kitty gets treats and lots of lap time and I also offer pet taxi for vet visits and other appointments,” says the enthusiastic entrepreneur. And here’s a bonus: Hammond is bonded and insured so if her clients want extra home security, they can request that she stay overnight. Oh yeah—if Fido likes to have bedtime stories or have his belly rubbed a certain way, have no fear. That will all be taken care of. But beware: plugging into this service is addictive and it’s now easier than ever to walk away from home—and your pets.